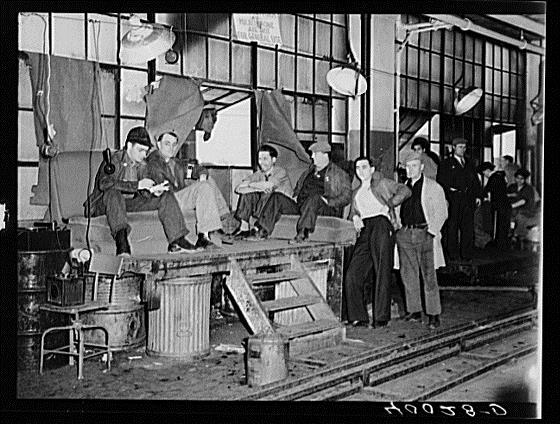 From December 30, 1936 to February 11th, 1937 the workers of Flint’s auto industry took part in what is now known as the Flint Sit Down Strike. On the day of December 30 the Union learned that GM was planning to move the dies out of Fisher #1. Immediately a meeting was called at lunchtime at the union hall across the street from the plant, the situation was explained, and then members were sent across the street to occupy the plant. The Flint sit-down strike had begun. In a conventional strike the union takes its members outside the plant and attempts to prevent the employer from operating by depressing other employees from entering. In a sit-down strike, the workers occupy the plant themselves, keeping management and others out. By staying inside the factory rather than picket protesting outside of the plant, striking workers prevented owners from hiring strikebreakers (scab workers) to take their jobs and continue production. The Flint sit-down strikers set up their own civil system within their strike to help maintain stability. Eventually management had enough and called upon higher forces. Police attempted to enter the plant number 4 on January 11, 1937. The strikers inside the plant used fire hoses on the police while pelting them with car parts and other miscellaneous items as members of the women’s auxiliary broke windows in the plant to give strikers inside the plant relief from the tear gas the police were using against them. The police made several attemots, but after six hours withdrew. This incident is known as “The Battle of Bulls Run”, a mockery referring to the police (“bulls”). Fourteen strikers were injured by gunfire during the battle. On Febuary 11th or 1937 and an agreement was made that recognized the UAW as the exclusive bargaining representative for GM’s employees who were members of the union for the next six months. Within the next year the UAW saw its membership grow dramatically from 30,000 to 500,000 members.